I must apologize for my lack of presence lately. I’ve been sucking at blogging, Instagram, and all things technology… minus some dumb and addictive slots game I’ve been playing on my phone. I got engaged, I’ve been working at the bar a lot, and my youngest baby started crawling. It’s been hell. But, I haven’t forgotten about you all! In fact, I have been dreaming up posts and all kinds of freebies that I want to add to The Petite Planner by the end of the year. Which means, if you haven’t signed up for my mailing list, you should. My VIP Resource Library is about to get a few upgrades, and you may want to be around to download them. However, I have some other important things going on right now, and I haven’t had time for all the technical stuff. So, today I’m sharing a list of some of the best brush lettering resources on the web. 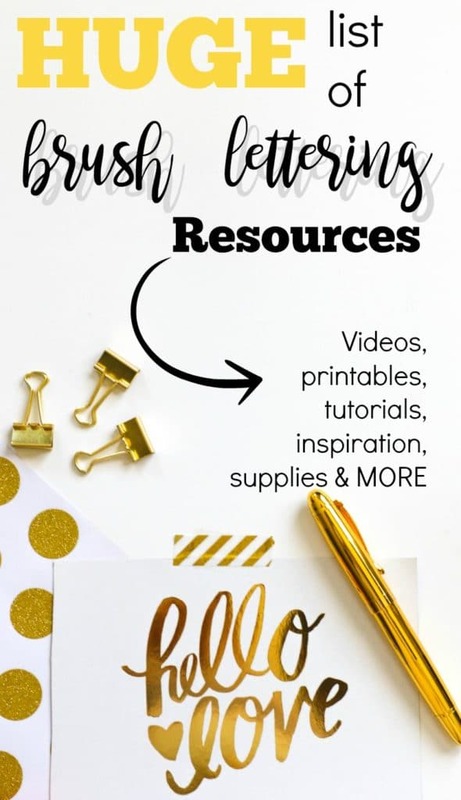 From practice worksheets to video tutorials and supplies to inspiration, I hope I’ve included what you are looking for. Flourish & Underlining: Amy from One Artsy Mama does a spectacular job teaching her readers how to add flourishes to their brush lettering. She starts simple, then instructs how to do more complex flourishes, and finally how to combine them together. And of course, it wouldn’t be complete without a free printable practice sheet. Beginner Brush Lettering: Shelby from Little Coffee Fox is one of my biggest brush lettering inspirations. In this post, she covers the basics, plus supplies, techniques, tricks, and a free worksheet. Alphabet Practice: I had to include myself in this list, right? That’s right! I got your brush lettering alphabet practice sheets covered. With upper and lowercase letters, plus some words to practice, these sheets will certainly help you get better at brush lettering. How to Add Bounce to Your Letters: Have you seen the gorgeous bounce lettering on Pinterest and Instagram and wondered how to do it? Now you have the one tool you need to learn. This post contains a very informative and helpful video to guide you in your bounce lettering. Fake Brush Lettering: It’s not cheating, it’s genius! It’s also pretty simple. With this tutorial, you will get step by step instructions with pictures to guide you. When you’re done, your faux calligraphy will be as good as the real thing. 30 Days Worth of Printable Practice Sheets: If you are ready to put yourself to the ultimate brush lettering challenge, check out Dawn’s “30 Days to Better Brush Lettering” post. She includes daily printables and videos to help you get better at brush lettering. Facebook Group to Learn Brush Lettering: This group is run by Dawn. Yes, the same Dawn from above. 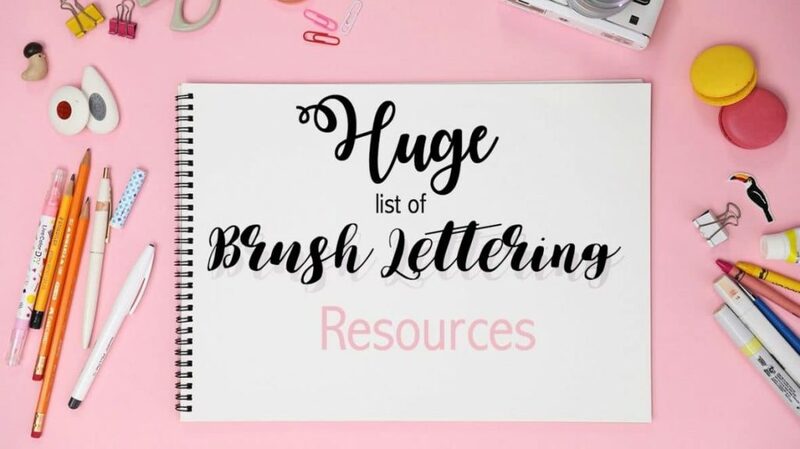 If you are serious about improving your skills in art and brush lettering, check out her group and get familiar with her blog, Dawn Nicole Designs. Amazon: Typically, I go to Amazon for all of my bullet journal and brush lettering supplies. I find that they are usually the cheapest and have the widest selection. Etsy: I don’t recommend buying your pens from Etsy, but if you are looking to spend some money on practice workbooks, Etsy is a fabulous place to find quality printables and practice guides. Here’s a 90 Day Challenge Pack for under $10 to really get your creative juices flowing. AliExpress: Are you willing to wait a little longer for your supplies to get to you if you can get them for super cheap? AliExpress has some very inexpensive options for brush pens. Plus, I usually find some other, totally non-essential things that I want to try out since they are low priced. JetPens: Lastly, JetPens is obviously known for their wide variety and availability of pens, markers, and stationery supplies. They can be a little more expensive than the above options, but it’s also likely they will have whatever you are looking for. Brush Lettering Pinterest Board: I pin tutorials, inspiration, printable worksheets, etc. to this board. I love Pinterest and use it all the time to better my skills and learn new ones. Loveleigh Loops Instagram: Jillian and Jordan are twin sisters who have, over the years, refined and perfected their brush lettering skills. And they aren’t shy about how they’ve done it. They constantly show tricks and tips and talk about how to improve your own brush lettering. Essy Creates Instagram: Essy is another artistic lettering genius. Her work is stunning! And if you just need a little stationery eye candy, I highly suggest her feed. The Calligraphy Hub: This is a Facebook page I have followed for quite a while now. They usually have pretty awesome calligraphy and brush lettering videos and pictures. They also post links to some helpful resources. Ultimate Brush Pen Review: Lyssy put just about every brush pen to the test in this post and video. Not only that, she categorizes the pens for you, tells you which are best for beginners, and gives her honest opinion about pens you should avoid. Tombow’s YouTube Channel: This is where I started with brush lettering. I saw one of their videos shared on Facebook and then followed it over to YouTube. I watched an unnecessary number of videos and followed along with some of their tutorials. Now I follow them for inspiration and to better my skills. Kelly Creates YouTube Channel: For those who really prefer video over blog style instruction, check out Kelly’s channel. She does a number of instructional videos, some pen reviews, and offers her top tips for brush lettering. Inspiring Fonts: Once you have a grasp on brush lettering, you may want to change up your style. I look through the brush fonts on DaFont.com for inspiration. Want access to all my freebies? Subscribe to my Newsletter and you’ll get access to my VIP Resource Library with tons of free printables for brush lettering, bullet journaling, and more.